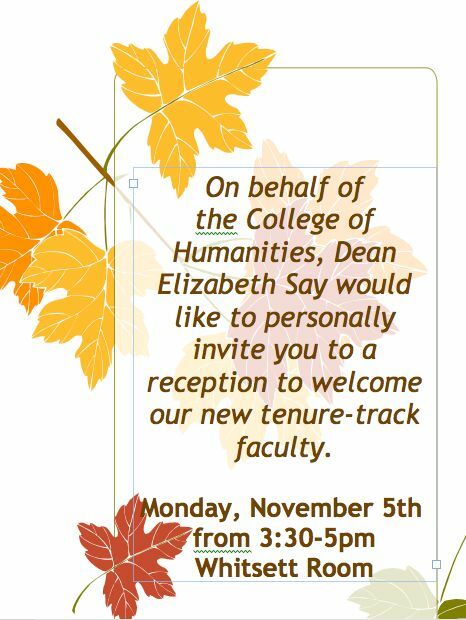 Don’t miss the College of Humanities new faculty reception on November 5. Come meet all our new wonderful colleagues! And don’t forget tonight’s NCWC reading by the award-winning and bestselling fiction writer Ben Loory. Loory will read from his short story collection, Stories for Nighttime and Some for the Day (Penguin 2011), now in its fourth edition, and recognized by such distinctions as a selection of the Barnes & Noble Discover Great New Writers Program and the Starbucks Coffee Bookish Reading Club. Individually, Loory’s stories have appeared widely, in such magazines as Fairy Tale Review, The Nervous Breakdown, The New Yorker, Space and Time, and Word Riot. Loory has also worked as a screenwriter. And students who have met him praise his warmth, accessibility, affability and all-around brilliance and humor. Come see what they’re talking about, tonight, from 7:00 p.m. to 9:00 p.m. in the Nobbs Auditorium of Sequoia Hall (Room 104). All are welcome. Also not to be forgotten, Bobby Lopez’s “Myth Goes to the Movies” gallery exhibition of student research and panel of War on Terror veterans discussing Veterans, the Middle East, and Reflections on Lawrence of Arabia will be taking place on Thursday, November 8, from 7:00 p.m. to 9:00 p.m., in the LNJ Reading Room (JR 319). Doors open at At 7:00 p.m. for research exhibits, and the panel–featuring Valvincent Reyes LCSW, BCD; Lt Joseph B. Lonergan; and our very own Melissa Filbeck, Jason Freudenrich, and Pierre Marcos–will begin at 7:30. This event is free and open to the public. Refreshments and food will be provided. Stanley Goodfriend, President and Founder of Loansuperstore.com, is looking for a business-savvy, new media-adept intern to raise his online profile. Goodfriend would like to optimize his web presence by making better use of such social networking media as Facebook and LinkedIn, as well as other web tools, like YouTube. This internship requires someone who is a resourceful, creative, and independent problem solver, who can write and design, and who is not afraid of business terminologies. The position is part-time and flexible, and for the right person with appropriate skills, could lead into a half-time paid position. For more information, please contact Stanley Goodfriend at Stanley@loansuperstore.com. Frasco Investigative Services, a full service investigative firm specializing in insurance claims investigations is currently seeking candidates for Claims Investigator positions to take statements, primarily concerning workers’ compensation and premises liability claims. English students may be very interested in this position, as it requires investigators to gather the facts of a claim through extensive interviews and present these facts in a well written report. The position offers a great deal of flexibility in scheduling and pays according to billable hours. Qualified candidates must have a natural investigative curiosity and instinct, and strong interpersonal, time management and report writing skills. They must also have a reliable vehicle and proof of insurance, a home computer or laptop with internet connection, a cell phone and digital camera. Bilingual candidates are highly desirable. For more information, please contact Peter A. Goul, Regional Manager, at pgoul@frasco.com. Melissa Filbeck read her paper, “From Harper Hall to The Hunger Games: Teenage Female Protagonists in YA Science Fiction,” for the panel Science Fiction I: Gendered Bodies in SF. Stephanie Harper read her paper, “(Avoiding) ‘The Reprobate State of a Useless Creature’: The Value of Women in the Turkish Embassy Letters,” on the panel English (1700 to Present) I. Additionally, she chaired the panel English (1700 to Present) II. Susana Marcelo read her story, “The Modern Ixchel,” on the panel Folklore and Mythology II. Hannah Jorgenson read her paper “The Aesthetics of Self-Destruction” on the panel Gothic II. Trista Payte read her paper, “Either I’m Nobody or I’m a Nation: Strategies for Post-colonial Selfhood Explored Through Earl Lovelace’s The Dragon Can’t Dance,” on the panel Postcolonial Literature II. Joseph Galasso has been busy! His article, “A Brief Perspective on the Role of ‘Private vs. Public’: Unions, University, and the Emergent Middle Class in the Context of a Reagan Legacy” will appear in the May/June, 2013 issue of Academe. And the revised edition of his text, Minimal of English Grammar: Vol 1 and Vol 2, will be published in 2013 by Cognella Publications. Kate Haake‘s essay, “Diptych: Chrysalis, Prayer,” published last fall in Crazyhorse, was selected for the “Notables” section of this year’s Best American Essays. 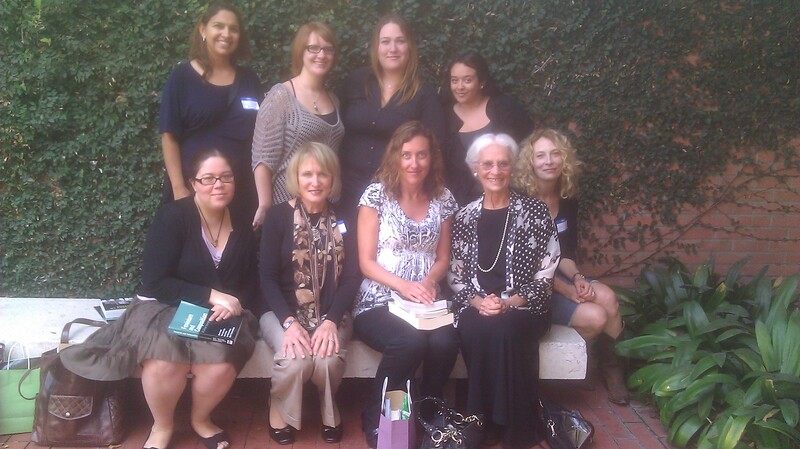 On Friday, October 5th, eight faculty members from Northridge attended a workshop given by Professor Andrea Lunsford (Stanford University), which took place at California State University, Long Beach. The topic was “Social Media and Student Writing” and the attendees were Norma Aceves, Irene Clark, Elizabeth Jurgensen, Gina Lawrence, Michelle Mutti, Ann O’Bryan, Tiffany Palioungas, and Lida Perez. October also inaugurates an exciting new series of Brown Bag events, co-ordinated this fall by Martin Pousson who is generously stepping in for Leilani Hall while she is on leave. Well, ok, the first one already took place this afternoon (too late for these notes), but warrants announcing anyway, for the record. And while we are at it, welcome back, Kim! 1. On Thursday, October 11, a 3:00 o’clock in the afternoon, new faculty lecturer, star alumna, and distinguished poet Kim Young was featured in the first Brown Bag event of Fall 2012. Kim read from her award-winning new book of poetry, Night Radio. A CSUN alumna, Kim Young won the Jane Kenyon Scholarship at Bennington College, where she was granted a MFA degree. She is the author of Divided Highway, a chapbook, the editor of Chaparral, and the recipient of the Agha Shahid Ali Poetry Prize. This Fall 2012, she joined the faculty of the English Department. 2. On Monday, October 15, three new faculty professors, Dr. Danielle Spratt, Dr. Nate Mills, and Dr. Lauren Byler, will be featured in the second Brown Bag event of Fall 2012. From 2:30-4:00 PM in the LNJ Reading Room (JR 319) Dr. Spratt, Dr. Mills, and Dr. Byler will present an overview of their research and scholarship. After their presentations, both undergraduate and graduate students are invited–encouraged!–to pose questions during a Q&A about graduate program applications and professional development. Dr. Spratt joined the faculty of the English Department in Fall 2011, with a PhD from Fordham University. She has published work on Swift, Garrick, and Siddons, serves as a 826LA leader, and now advises for the First-Year Integrated and Junior-Year Integrated programs. Dr. Mills joined the faculty of the English Department in Fall 2012, with a Ph.D. from University of Michigan, where he was awarded the ProQuest Distinguished Dissertation Award and the Clarence D. Thorpe Dissertation Prize. He has published work on Ellison, Baldwin, Cleaver, Alridge, and Benjamin. Dr. Byler joined the faculty of the English Department in Fall 2012, with a PhD from Tufts University. She has published work on Dickens and Trollope. 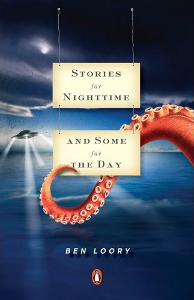 Also coming up, our amazing NCWC crew is hosting another reading by another illustrious LA local literati, the award-winning and bestselling fiction writer Ben Loory, who will read from his short story collection, Stories for Nighttime and Some for the Day (Penguin 2011). Now in its fourth edition, this collection was chosen as a selection of the Barnes & Noble Discover Great New Writers Program and the Starbucks Coffee Bookish Reading Club, and was named one of the 10 Best Fiction Books of the Year by the Hudson Booksellers retail chain. Individually, Loory’s stories have appeared widely, in such magazines as Fairy Tale Review, The Nervous Breakdown, The New Yorker, Space and Time, and Word Riot. Loory has also worked as a screenwriter. And students who have met him praise his warmth, accessibility, affability and all-around brilliance and humor. Come see what they’re talking about on October 25, from 7:00 p.m. to 9:00 p.m. in the Nobbs Auditorium of Sequoia Hall (Room 104). All are welcome. And while we are on the subject of the NCWC, kudos to all for their first fabulous event of the year, last week’s well-attended poetry reading by the inspiring Michelle Bitting. Speaking of student clubs, the CSUN Critical Theory Club, whose mission is to bring students and professors together through conversations about theory, has announced it first meeting of the year, which will take place on Tuesday, October 16th from 3:00 p.m. to 5 p.m. in Sierra Tower 703. They will be discussing Harold Bloom’s The Anxiety of Influence and T.S. Eliot’s “Tradition and the Individual Talent” led by the amazing duo, Sean Pessin and George Fekaris with Dr. Bobby Lopez as their invited professor. Please help spread the word. They are also inviting book suggestions for November meeting, so if anyone knows any really cool theory, please let their President, Norma Aceves, know. For more information, please email them at ctc@my.csun.edu. Now available for your reading pleasure, past issues of the Northridge Review–almost all of them!–can now be found on CSUN’s ScholarWorks page at http://scholarworks.csun.edu/handle/10211.2/1713. (Follow the link, then click on “Titles” under “This Collection” on the left hand side of the page.) Also to be found are past issues of Angel’s Flight and Eclipse. This is a great new resource–please let your students know about it. On Thursday, November 8, from 7:00 p.m. to 9:00 p.m., in the LNJ Reading Room (JR 319), Bobby Lopez’s “Myth Goes to the Movies” project will be holding its second event, a gallery exhibition of student research and panel of War on Terror veterans discussing Veterans, the Middle East, and Reflections on Lawrence of Arabia. Doors open at At 7:00 p.m. for research exhibits, and the panel will begin at 7:30. This event is free and open to the public. Refreshments and food will be provided. Looking ahead, the CSUN Research Fellows Program, funded collaboratively by the Office of the Provost, the Colleges and the Library, will again this year be providing twelve units of reassigned time and a small research budge to the tenured and/or probationary faculty who submit the winning proposals. Nine fellowships research will be awarded each–one per College and one in the Library–and the deadline this year will be January 21, 2013. Stay tuned for additional details, and start working on your best ideas now! Faculty Development and CSUN Human Resources has announced a series of exciting events for October alone. Highlights include, but are not limited to, The Importance of Ethics: An Inspirational Introduction, presented by Michael Josephson (CHARACTER COUNTS! ), on October 9, from 2:00 p.m. to 4:00 p.m.; The Somatic Experience, presented by George Lough, on October 12, from 12:00 p.m. to 1:00 p.m.; Mentoring on the Run, Part 2, presented by Glenn Omatsu on October 16, from 1:00 p.m. to 2:00 p.m.–and especially not to be missed, Basic Business Writing, by our own Irene Clark, on October 16, from 10:00 a.m. to 11:15 a.m. http://blogs.csun.edu/faculty-development/co-sponsored-events-for-fall-2012/. And while you are at it, check out the App Harvest–the Faculty Technology Center and Faculty Development are collecting suggestions for apps related to teaching, learning or other educational ventures. Take a minute out of your day to share your favorite app with them at https://docs.google.com/spreadsheet/viewform?formkey=dHg3Qmc2ZlB5cXhtSmZ2Zzg3S0R5dkE6MQ#gid=0. If you find yourself in Ojai this weekend, don’t forget about the October 13 reading at Bart’s Books, featuring What Books authors, Chuck Rosenthal, Mona Houghton, and Kate Haake. Creative Age Communications, a publisher of magazines for the professional beauty industry, is looking for interns for the 2012/13 school year (Fall, Spring and/or Summer semesters). Responsibilities include: Writing and editing short articles for their magazines and websites; posting stories on the magazine websites using their content management system; SEO. The more initiative displayed, the more opportunities available. School credit available. For more information on their magazines, please visit www.beautylaunchpad.com, www.nailpro.com, and www.dayspa.com. Applicants should send a cover letter and resume to: Stephanie Lavery, Editorial Director, SLavery@creativeage.com. The University of Nevada, Las Vegas, is now in its fifth year of publishing Wordriver Literary Review, a journal which provides a platform strictly for poetry, fiction, and creative nonfiction written by Part-time lecturers. Past issues have featured work by instructors from all corners of the USA, as well as the United Arab Emirates and the UK. Given the number of talented writers we have among us, the next issue should surely feature one of ours. More information can be found at http://wordriverreview.unlv.edu. Palooka, a nonprofit literary magazine in both print and electronic forms, is seeking fiction, creative nonfiction, poetry, plays, graphic short stories, graphic essays, comic strips, artwork, photography, and multimedia for their next issue. The editors of this journal see themselves as “determined to find those writers and artists who are hungry and relevant, flying under the radar, producing great works that are going unnoticed by other magazines,” and they claim to read all the words of everything sent to them. Dedicated to publishing the “the up-and-comer, the underdog in the literary battle royale,” they’ve asked us to let our students know, so please pass this information on. More information can be found on their homepage at http://www.palookamag.com/. The editors of River Teeth invite nonfiction writers to submit their book-length manuscript for the annual River Teeth Literary Nonfiction Book Prize! The deadline is November 1. Submissions can be entered online via Submittable or through the mail. Kate Haake, Mona Houghton, and Rick Mitchell all gave readings at the West Hollywood Book Festival, appearing (separately) in the Poetry Corner (books fairs not being all that particular about genre, it seems). Martin Pousson has published a poem, “El Salvador,” in the current issue of Chaparral (http://www.chaparralpoetry.net/), from his collection in progress, Mississippi River Anthology.